d i a p s a l m a t a: Leibnizian dreams in reason's limbo. Leibnizian dreams in reason's limbo. The most fertile methods today concerning the mythical text in general are regulated by an algebra and, more precisely, by a combinative algebra. There exists to begin with -- or, better yet, it is possible to constitute -- a set of discrete elements, of units. Out of this reservoir circulate combinative sequences that can be mastered. Hence the theory of musical forms that is certainly the most general available organon, both practical and constructible, for these operations. This algebraic method is, to my mind, a local realization three centuries later of the Leibnizian dream of an alphabet of human thoughts for which its author had forged an ars combinatoria -- first invention, precisely, of combinative algebra as well as of a logic of the note, of any discrete note. 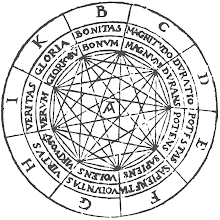 From which Leibniz derived the ideathat music was indeed the language closest to the universal language, or to the mathesis universalis. This was an idea to which philosophers turned a deaf ear, but which was heard by musicians, since at Johann Sebastian Bach's death, Leibniz's De Arte Combinatoria was discovered at the composer's bedside (which, in return, permits us to read several fugues). All this occurred in the midst of the classical age, at a moment when the discourse of rationality was definitively replacing the mythical text. The art has now become a science, a productive and fertile method, the operational realization of a project left in reason's limbo during that period.